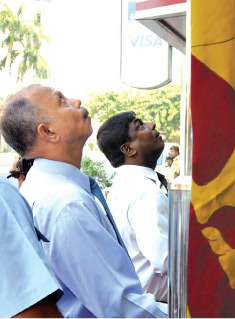 Chief Executive Officer and General Manager of People’s Bank, N. Vasantha Kumar hoists the national flag at the People’s Bank Head Office. The General Manager presents a gift to a newborn baby at the Castle Street Hospital, Borella. The People's Bank presented Isuru Udana Gift Certificates worth Rs. 500 each to every baby born in the country between February 1 and 7, to commemorate Independence Day. The program Nidahase Upatha, is conducted every year. It was inaugurated in 2006 to instil pride and honour towards our motherland and to encourage parents to have a target for their children. With this Gift Certificate, parents can open an Isuru Udana Children's Savings Account for the child at the nearest People's Bank branch using the amount in the Gift Certificate and maintain the account thereafter. The speciality of this program is that the staff of People's Bank visit hospitals and present the certificates to the newborns in person. The main event of this program was held on February 4 at the Castle Street Maternity Hospital in Borella. The Chief Executive Officer and General Manager of People's Bank, N. Vasantha Kumar, Director of the Hospital, Dr. W.K. Wickremasinghe, staff of the hospital and the corporate and executive management of People's Bank were present. Gifts were also presented to parents of newborn babies.